Shalini Bitzer unlocks the door of a rather nondescript building at the back of the Allied Arts Guild. 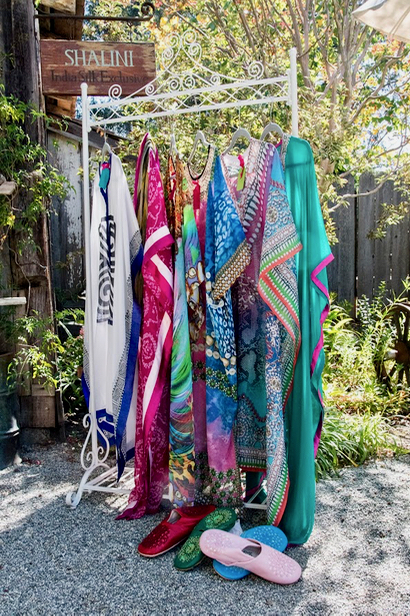 Nothing indicates the beauty that lies behind — a cornucopia of textiles in a variety of colors, patterns and textures that Shalini sells at her India Silk studio. Her business is mostly retail and often with interior decorators, although the savvy consumer is welcome as well — all by appointment. Shalini carries on a business that was first started by her grandfather, Sunderlal Mehta, in the 1960s, initially focusing exclusively on silk. After 15 years, he expanded into linen, cottons, and polyesters. Her grandfather stayed active until he was 99 years old, and Shalini’s mother has been fully involved in India Silk since then, working out of a Florida office. “It’s really fulfilling to carry on the tradition that my grandfather began,” she says. Shalini’s mother was sent to textile school in Germany by Sunderlal. She was initially miserable before meeting and marrying a handsome German man who was an architect. Shalini spent her younger years in Baden-Baden in the southern part of Germany, and then attended an international boarding school in the Himalayan mountains.